Many thanks to Daniel Williams who wrote an informative article on Hub Pages titled “Sasquatch, Humanities Big Brother Race, Reveals The Soul Evolution of Mother Earth.” This article is a beautiful introduction and summary of the Sasquatch Message to Humanity, that SunBôw (DawaOutah LomaKatsi) wrote, as channeled to him by the Sasquatch Elder named Kamooh. “As with most, mysterious stories and folklore, at least, concerning Sasquatch or Bigfoot, the biggest detractor to this mythology is the lack of evidence, either physical (a body or skeleton) or in the form of clear photographs or video. However this can be easily explained by the habits, paranormal abilities and elusive nature of the Sasquatch. Because this being is also a threat to the current Powers That Be, much of the evidence that has been collected in the last 100 years by researchers and scientists, has been censored from public examination. There currently exists today a preponderance of physical evidence and anecdotal eyewitness testimony showing that indeed another sentient bi-pedal humanoid species exists here on Earth. The elusive nature of the Sasquatch Race and its unique paranormal psychic abilities has prevented mankind from interacting with this species for the last few thousand years. The human race’s unwillingness to accept the metaphysical sciences and its relationship to nature, into their educational paradigm, prevents the majority of humanity from even recognizing or exploring these kinds of subjects and for that matter many similar topics such as the Secret Space Program and Breakaway Civilizations, Hollow Earth and Aliens and UFOs. Due to this conditioning all parties concerned are simply unwilling to expose this subject to the general population, and yet they are all interrelated. What needs to emphasized here is the amount of ridicule and scorn concerning the topic of Big Foot or Sasquatch by the Mainstream Media, prevents many researchers, scientist and even eye witness testimony from coming forward with new evidence. However as this topic becomes more mainstream and recognized what is being learned is that the history of Sasquatch goes far back into the annuals of recorded history, not just in North America but world wide. Many researchers feel that the reason this subject is being so thoroughly ignored in the scientific community is that the Sasquatch may hold the key to unlocking humanities past that has been censored from our education for so long. One of the main reasons the current rulers of this planet, let’s call them the Cabal for simplicity sake, are so afraid of the Sasquatch and are even now trying to locate and exterminate them, is that the Sasquatch race holds the true memories of humanities past history on this planet. If revealed publicly, this information would rewrite our history books and current world view, overnight. Because the Cabal wishes the Sasquatch to be enslaved and used, the same as the rest of the human race, they have tried unsuccessfully to trap them or exterminate them for thousands of years. Failing to eradicate the Sasquatch has forced the Cabal to use other tactics, such as ridicule, censorship and fear to prevent the average man from learning the truth. The Sasquatch Race has a highly developed telepathic and psychic communication system and can determine a persons intentions from many miles away. Their psychic abilities also allow them to move inter-dimensionally by opening space/time passages, which give them the ability to appear and disappear at will. Recent whistleblowers of secret black operations reveal that this kind of psychic ability is humanly possible, so why couldn’t an ancient race of humanoids older than modern man not have developed this ability as well? Kewaunee and Kelly Lapseritis had the honor of speaking at In5d’s Lifting the Cosmic Veil Conference on March 18, 2017 in Seattle, WA along with Michelle Walling, Emma Louise LivingSoul, Eric Raines, and Brad Johnson. This is part 2 of the conference, recorded and edited by Michelle Walling. Kewaunee and Kelly are in part 2. On behalf of the Sasquatch People, Mother Earth, and all of Humanity, we propose a spiritual and ecological approach to healing our planet and our own collective soul consciousness. We are all related, all children of Mother Earth, and it is our responsibility to live and work together to create peace and harmony for all living beings. Our speakers will share their own personal encounters with these sentient beings as well as the messages that have been shared with them to assist in improving and healing ourselves, relationships, and perspective realities. 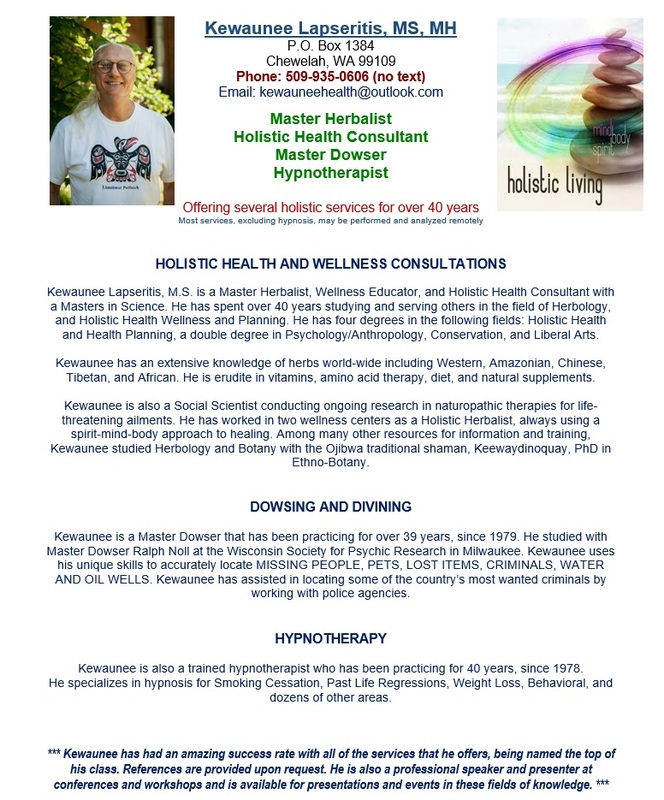 This year, we will also be offering workshops on various spiritual, metaphysical, shamanic, and self-help subjects such as meditation, learning how to use spiritual tools, psychic readings, energy artists, healing sessions, etc. which may be subject to additional fees by the vendors and workshop presenters. Early Bird pricing ended on 2/28/17. Standard prices are as followed (with an additional service fee from Eventbrite) and will run until June 30, 2017. On July 1st until the day of the conference, ticket prices increase either $10 or $11 to make it a round figure. All children age 14 and under are free. If you would like a fire-roasted turkey dinner with all the fixins on Saturday night (9/2), please purchase your meal ticket separately for $18 per person. RED: $79 for a 1 Day Pass (9/1, 9/2, or 9/3) – This pass admits one person for one day (Friday, Saturday, or Sunday) at the conference, not including camping. If you would like a pass for 2 days, you may purchase 2 of these tickets or purchase the 3-Day Pass. ORANGE: $99 for a 1 Day and 1 Night camping pass – This pass admits one person for one day at the conference and one night of camping on the grounds, your own RV, or the dorm bunk (Friday, Saturday, or Sunday). If you would like a pass for 2 days, you may purchase 2 of these tickets or purchase the 3-Day Pass. YELLOW: $150 for a 1 Day and 1 Night FAMILY Pass – This pass admits 2 (two) adults and up to 4 children of any age for one day at the conference and one night of camping on the grounds or your own RV only (no dorms) Friday, Saturday, or Sunday. If you would like a pass for 2 days, you may purchase 2 of these tickets or purchase the 3-Day FAMILY Pass. GREEN: $250 for a 1 Day and 1 Night GROUP Pass – This pass admits 4 (four) adults for one day at the conference and one night of camping on the grounds or your own RV only (no dorms) Friday, Saturday, or Sunday. If you would like a pass for 2 days, you may purchase 2 of these tickets or purchase the 3-Day GROUP Pass. AQUA: $249 for a 3 Day Pass (no camping) – This pass admits one person for three days at the conference (Friday, Saturday, and Sunday). If you would like a pass for 1 or 2 days only, you may purchase the 1 Day Pass. BLUE: $299 for a 3 Day and 3 Night camping Pass – This pass admits one person for three days at the conference and three nights of camping on the grounds, your own RV, or the dorm bunk (Friday, Saturday, and Sunday). If you would like a pass for 1 or 2 days, you may purchase the 1 Day Pass. PURPLE: $390 for a 3 Day and 3 Night FAMILY Pass – This pass admits 2 (two) adults and up to 4 (four) children of any age for three days at the conference and three nights of camping on the grounds or your own RV only (no dorms) Friday, Saturday, and Sunday. If you would like a pass for 1 or 2 days for your family, you may purchase the 1 Day FAMILY Pass. PINK: $600 for a 3 Day and 3 Night GROUP Pass – This pass admits 4 (four) adults for three days at the conference and three nights of camping on the grounds, your own RV, or the dorm bunk (Friday, Saturday, and Sunday). If you would like a pass for 1 or 2 days for your group, you may purchase the 1 Day GROUP Pass. Seating is limited to 380 people in the lodge during the conference. * Hardship scholarships and discounted ticket prices for work volunteers may be available. 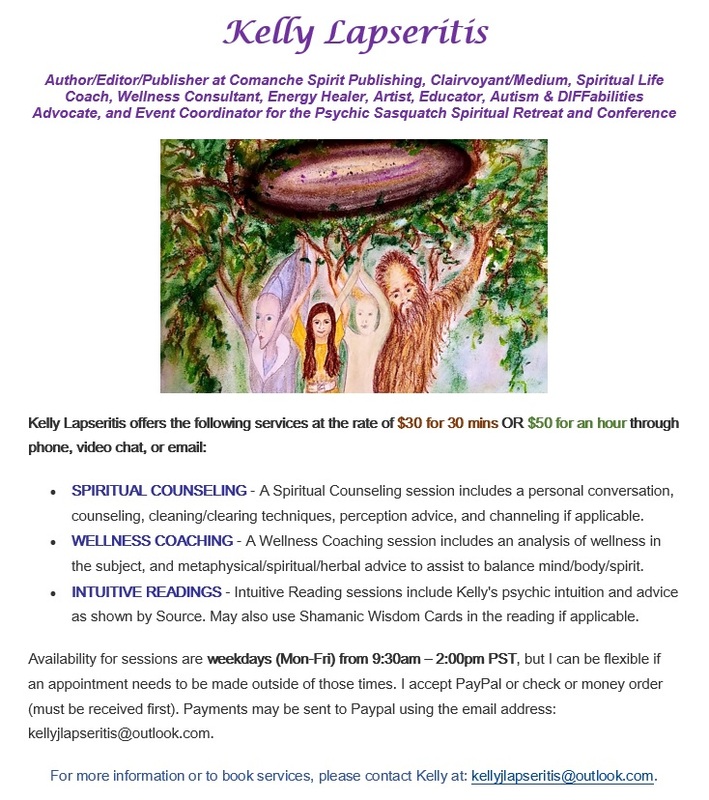 Please email kellyjlapseritis@outlook.com to inquire. Speakers and presenters are offered a vending table for $100 for the entire weekend. Any other individuals or organizations interested in vending during the event (Fri. Sept. 1st – Sun. Sept. 3rd) may purchase a Vendors ticket for $300 for the 3-day weekend or $150 per day which includes 2 people (vendor and assistant) and sleeping at the facility (tent, bunk, or RV) as well as access to the conference and event activities. If there are additional people travelling in the vendor’s group, they are subject to regular ticket prices (with the exception of children under 14). We are able to provide up to 2 large round tables for vendors but if you require special accommodations or equipment, the vendor is responsible to provide them. A new feature that the event will offer this year are workshops on various spiritual, metaphysical, shamanic, and self-help subjects such as meditation, light language sessions, learning how to use crystals and other spiritual tools, psychic readings, energy artists, etc. Anyone that is interested in presenting a workshop during the event (Fri. Sept. 1st – Sun. Sept. 3rd) may purchase a Workshop ticket for $300 for the 3-day weekend or $150 per day which includes 2 people (vendor and assistant) and sleeping at the facility (tent, bunk, or RV) as well as access to the conference and event activities. If there are additional people travelling in the workshop group, they are subject to regular ticket prices (with the exception of children under 14). We are able to provide a private room, chairs, and a table for materials for workshops but if you require special accommodations or equipment, the workshop presenter is responsible to provide them. Workshop presenters are also required to pay the event hosts, Kewaunee and Kelly Lapseritis, 30% of workshop sales for the use of the rented space and equipment. Workshop presenters are limited to 2 hour sessions but will have an opportunity to hold up to 2 workshops a day. Workshop presenters must apply with the Lapseritis’ and provide an outline and overview of the materials that will be discussed. Please email kellyjlapseritis@outlook.com for inquiries. Terms are subject to change and negotiations depending on various factors.